Posted on Tue, Dec 6, 2011 : 1 p.m.
A look at the approved expansion of Ann Arbor's Greenbelt district into Lodi and Salem townships. After preserving 3,200 acres of land surrounding Ann Arbor over the past eight years, the city's Greenbelt program is gaining momentum. 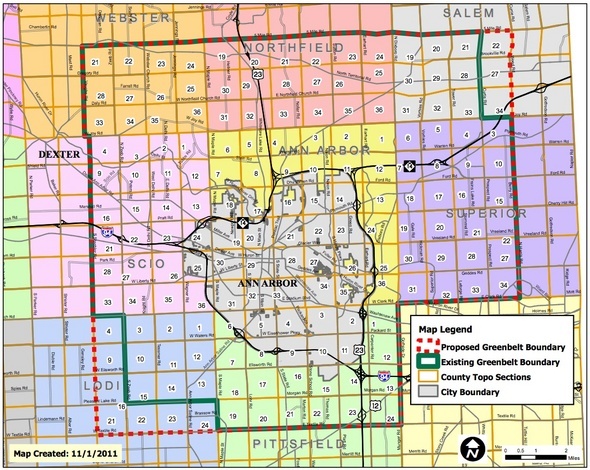 The Ann Arbor City Council gave final approval Monday night to expand the Greenbelt district boundaries further into Salem and Lodi townships, adding 10 square miles of land to the area where city officials are working to preserve farmland and open space. "This expands it by about 6 percent," said Council Member Carsten Hohnke, D-5th Ward and a member of the city's Greenbelt Advisory Commission. "This recognizes the partnership that we've developed with Superior and Lodi townships, and just the knowledge that's been gained over the eight years of administering the program, and understanding where the opportunities are for best leveraging the dollars." Council Member Carsten Hohnke, D-5th Ward, said it's not unreasonable to expect the city will have preserved 10,000 acres of land by the time the Greenbelt program concludes. The city pays for Greenbelt purchases using proceeds from the Open Space and Parkland Preservation millage, which brings in more than $2 million annually from city taxpayers. Ann Arbor voters authorized the 0.5-mill tax for 30 years in 2003. It provides funds for parkland acquisition within the city and the preservation of open space, agricultural land, and other natural habitats outside the city in a designated Greenbelt district. At the time the program was approved, a significant amount of development activity was occurring around Washtenaw County and farmland was being sold off to developers. A goal of the program is to counter urban sprawl and preserve sustainable farming. The purchase of development rights keeps the property in the hands of the owner but ensures the land can't be developed and will remain preserved as open space. "I think it's been a huge success for the community, and one that has served us particularly well — and will for perpetuity," Hohnke said. "We as a community have leveraged our funds extremely wisely. For every dollar that Ann Arbor taxpayers have put in to preserve open space around the city, we've gotten more than another dollar from other sources." The only council member to oppose the expansion at Monday's meeting was Jane Lumm, an Independent who represents the 2nd Ward. She questioned whether spending millions to purchase the development rights to properties outside the city is the best use of city tax dollars during difficult economic times. 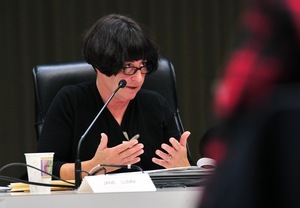 Lumm said she wondered how many boundary expansions there are going to be before the city considers repurposing a portion of the Greenbelt funding. "Only voters can change the Greenbelt millage," she said. "But that does not prevent council from deciding to present a proposal to voters to decide to repurpose some of the Greenbelt millage funds. Knowing my colleagues, I certainly don't expect that to happen anytime soon." She said the Greenbelt fund is "flush with cash," pointing out it has a $10 million fund balance and annual millage revenues exceed annual debt service by $1 million. Lumm argued the original compact with voters set boundaries for the Greenbelt and included provisions that one-third of the millage proceeds would be spent inside the city limits, and the city on average would be paying no more than one-third of the cost of purchases. "What are the results to date?" she said. "This will be the second expansion. The first was in 2007. Twenty-seven percent of the purchases have been parkland purchases inside the city, a bit lower than the one-third target. And the city has on average paid about half — 48 percent, to be precise — of the costs, certainly higher than the one-third target." Meanwhile, Lumm said, the city's parks are "starved for funds." She said the city owes it to taxpayers to monitor their tax dollars carefully and no program should be above scrutiny. Mayor John Hieftje said he supported the Greenbelt expansion with the expectation it will be the last time the boundaries grow. "But these little corners that are being brought in do present some unique opportunities, particularly down in the southwest," he said. Lodi Township has partnered with the city on the purchase of conservation easements, and Salem Township recently passed a purchase of development rights ordinance and has committed $1 million over the next five years to land preservation. By expanding the Greenbelt boundaries in those townships, city officials hope to capitalize on the potential for more partnerships to leverage the city's Greenbelt funds. Hieftje referenced one of the main literature pieces used during the Greenbelt campaign several years ago. It stated the millage would raise about $35 million from city taxpayers plus leverage $30 million to $50 million in matching funds from other sources. "So I think the program is consistent in doing that," he said. Dan Ezekiel, chairman of the Greenbelt Advisory Commission, recently reported the Greenbelt program has preserved 27 properties — about five square miles — around the city. He said that came at a cost of about $18 million to the city, and the city has leveraged another $19 million in matching funds from the federal government, the county, surrounding townships, nonprofit land conservancies, land owners and private organizations. Hieftje pointed out the state of Michigan eliminated a preservation program that was in place at the time the Greenbelt program was approved. "But we have been fortunate to garner, in many years, 90 percent of the federal money that comes to Michigan for farmland preservation — it's coming to the Greenbelt program and our partners in this area," he said. "So it's been very successful." Hohnke said it's not unreasonable to expect the city will have preserved 10,000 acres of land by the time the Greenbelt program concludes. Thu, Dec 8, 2011 : 2:11 a.m.
Why is it Ann Arbor's business if other townships want to develop their communities? If local areas are developed and people move to this area chances are those new folks will come to Ann Arbor and spend money here in town. Why are we forcing these people to move to Novi, Canton etc and spend their money in other communities. It's not like Ann Arbor was going to grow to the point where it swallowed up areas as far out as Dexter and Chelsea and became a city of 300-400,000 people. This is one of the biggest wastes of money I've seen in Ann Arbor. This is money that could be put toward public safety or something that benefits city residents like paving a road or two. Thu, Dec 8, 2011 : 2:57 a.m. These townships are participating in the Greenbelt millage. Read the article about how failed developments are bankrupting Sylvan Township to see the folly that results when rural townships chase development. Wed, Dec 7, 2011 : 3:55 p.m. Wed, Dec 7, 2011 : 1:49 p.m.
December 7,2012 The millage to purchase expires in 30 years fro when it became effective. I am not clear whether the city is purshasing the land or purchasing rights for 30 years so that the land can't be used for development. At the time the millage was being debated there was discussion but I need a refresher on the current status. I think if the city if the city is purchasing the rights for not to build, then it is a very bad deal and all AA citizens should rethink their position. Wed, Dec 7, 2011 : 8:03 p.m. It's purchasing the development rights on farmland and acquiring parkland. The development rights are owned by the city into the future. There's no expiration date on them. Wed, Dec 7, 2011 : 1:40 p.m.
Ann Arbor must think they are so special that they have to build a green fence around the city. They should limit their focus to the city limits. Maybe the townships don't want the expansion into their area. That must be why the townships have partnered with the city and are contributing to Greenbelt PDRs. Wed, Dec 7, 2011 : 1:12 p.m.
As long as the majority of Ann Arbor voters keep our mayor and most incumbent city council members in office, we need to quit complaining. Only a few of us are upset with the lack of visionary leadership, spending on personal and wasteful projects and following the wrong priorities. The majority has spoken and supports this bunch. Thu, Dec 8, 2011 : 2:13 a.m. Wed, Dec 7, 2011 : 12:07 p.m. I've been opposed to the greenbelt from the beginning and with the state of the economy, I've even more opposed. No one is going to be building any housing projects on the outskirts of town any time soon. The whole idea of having to get into the car and drive to enjoy some green space is ludicrous. The money needs to be spent maintaining the parks we have and building more inside the city where people can walk or bike to them. And as was pointed out, the city isn't even spending the specified 1/3 of the greenbelt funds on parks inside the city. Yet we've been told there's no money to maintain city parks. Let's put it to a vote again. Perhaps in this economy the citizens of Ann Arbor would rather have the money go somewhere else right now, say to firefighters and police. There are already two permanently closed fire stations. Yes, I hate the miles of condos and huge subdivisions on the outskirts of town but they're already built and there are plenty of empty homes in and outside the city. So I don't see the rush to buy up more land for a greenbelt. Let's take care of what we have and add more parkland inside the city. And, lets build a park with a skating rink on top of the underground parking structure next to the downtown library. No downtown hotel has ever been a success. Why would one succeed now? The U has plenty of space for conferences. Wed, Dec 7, 2011 : 3:24 a.m. I'm curious how many of the people criticizing this program are homeowners in Ann Arbor. I suspect this program has not been explained to you in a way that highlights the benefits you gain, from a purely economic perspective. Essentially, this program is a landowners' cartel that fleeces the renting population (primarily students). As I understand it, the program acts to reduce the supply of develop-able land. As land grows scarce, the price of developed land will rise. Landowners are constricting the supply of land, just like OPEC constricts the supply of oil, profiting from the artificially high prices. The people who should really be upset about this are renters. They pay the tax too. (No, not directly. But when a tax is levied on a business, they pass the cost to their customers. The business here is housing rental, and the customers are renters. Property taxes are just passed on through higher rents.) However, renters gain nothing from the increased land prices. Homeowners are getting a sweet deal here. Renters are contributing to the fund, and it looks like a massive amount of money is coming from the federal government, nature conservancies, and so forth. Yet all the gains are harvested by landowners through higher prices. Of course, the gains are not immediate. Clearly, prices have fallen recently. But, with more land available, they may have fallen further than they did. There is obviously no housing boom right now, but (maybe I'm optimistic) eventually there will be demand for land again. When that demand cannot be met with more subdivisions because development rights are sold, it will rebound back and raise prices throughout Ann Arbor. Wed, Dec 7, 2011 : 4:29 a.m. The effect of the greenbelt on property prices have been over-exaggerated by developers from the conception of the program. If open space is not set aside, developers will gobble it up. Look no further than Canton to see he result of untethered development. If you like the result, I'm sure you could find a cheap place there to rent. Wed, Dec 7, 2011 : 12:45 a.m.
Tue, Dec 6, 2011 : 11:55 p.m.
We need to have the green belt fund and operation audited to determine if it is in compliance with the enabling public vote. If not then those responsible should be reprimanded and the program returned to its approved operating guidelines. I assue the City books are audited periodically -- what do the auditors say about this particular fund? A2.com -- this is a task for YOU. Get your &quot;investigative reporter hat on, FOIA the audits, and find out what is happening. Wed, Dec 7, 2011 : 4:35 a.m. The entire city budget is audited every year. Is there some particular reason you are focusing on the Greenbelt millage? Tue, Dec 6, 2011 : 11:36 p.m.
My wife just suggested maybe the council should only meet once a year. Because every time they meet they come up with another idiotic idea! Tue, Dec 6, 2011 : 11:33 p.m.
Why stop at the county line? After all we have money to burn! There is ONLY one person on city council that can handle business the way it should be! The rest of them should not be allowed on a middle school council! Tue, Dec 6, 2011 : 10:57 p.m.
What is this? Naysayers United? Do you people go to council meetings? Do you call or write or email your reps. on the council? Do you do anything to share your views besides complain on this blog about things that have already happened? In a democracy, the representatives (especially locally, where you can actually speak at meetings and get to know your reps.) will repond most to those who make their voices heard in the process of planning actions and least to those who complain after the fact. I hope that, before you complain here, you keep in touch with the Council (and your other representatives in government) and keep the pressure on them to do what you want done, and not to do what you don't want done. Those who don't get involved in politics are doomed to being ignored. Wed, Dec 7, 2011 : 12:39 a.m.
Half of the AnnArbor.com Curmudgeon Club don't even live in the city! Tue, Dec 6, 2011 : 10:13 p.m.
Tue, Dec 6, 2011 : 10:20 p.m.
Did you go to any council meetings to express your views? Tue, Dec 6, 2011 : 9:51 p.m.
At last we have our answer to Occupy Ann Arbor, the Delonis Center funding, and homeless panhandlers! Just include in the greenbelt agreement the right for the homeless, and the protesters to camp out as long as they like in the remote greenbelts. No doubt would make the streets safer. Tue, Dec 6, 2011 : 11:57 p.m.
Maybe one of those farmers would allow a tent city to be built on &quot;green belt&quot; supported land -- new homes for the homeless and OA2 folk all in one shot. Tue, Dec 6, 2011 : 9:48 p.m.
More useless land, more useless art...less public safety... all in one day... great place to live and pay taxes!. Tue, Dec 6, 2011 : 9:20 p.m. I agree that at least Lumm has a level headed view. Anyone interested in helping get a proposal on the next ballot to dissolve the Greenbelt fund completely and eliminate that millage? Wed, Dec 7, 2011 : 4:34 a.m.
Go for it. Tell us how many voters express support for your position. Tue, Dec 6, 2011 : 9:10 p.m.
Tue, Dec 6, 2011 : 9:04 p.m.
Actually, you can &quot;step foot on&quot; several of the properties. One such is the Fox Science Preserve in Scio Township, which is used quite a bit for school trips. Check out what has been preserved so far: <a href="http://www.a2gov.org/greenbelt/Pages/greenbelthome.aspx" rel='nofollow'>http://www.a2gov.org/greenbelt/Pages/greenbelthome.aspx</a> I think it is a wonderful program and I appreciate council's continued interest and stewardship. Future generations will also be glad that some of the unique ecosystems in our area have been preserved. Wed, Dec 7, 2011 : 4:33 a.m.
More disinformation? The greenbelt millage is for the purchase of park land AND development rights. Don't let the facts get in the way of your rant though. Tue, Dec 6, 2011 : 9:23 p.m. Your kidding, right? Greenbelt land is still owned privately. Greenbelt essentially takes away their development rights and then compensates them for it. The city doesn't own the land. If you can set foot on the land today, its because you could set foot on the land before the city paid off the owner of the land. Tue, Dec 6, 2011 : 9 p.m.
Hey it provides a long term bigger benefit than an invisible piece of overpriced public art in a &quot;rain garden&quot; with questionable visibility at the bottom of a hill on Kingsley and First that everyone just drives down so they can hurry up and avoid traffic on Main St.
Tue, Dec 6, 2011 : 8:42 p.m.
We're getting a moat? Cool....with a moat we can lay off more cops! And use the water with buckets to fight any potential fire threat...and put in alligators to keep the criminal element out! Tue, Dec 6, 2011 : 8:41 p.m. I agree with the greenbelt concept. I believe our children and grandchildren will benefit. However, if our parks already in existence are not being maintained adequately, then why not use some of the dollars set aside for greenbelt for the internal green plots. Someone mentioned the sale of Huron Hills. Sounds like that is green land that should be protected for the good of the people and not sold off. Tue, Dec 6, 2011 : 8:58 p.m.
Our grandchildren would benefit more if we stopped spending their money. Tue, Dec 6, 2011 : 8:34 p.m. Wed, Dec 7, 2011 : 2:13 a.m. Yes, but shouldn't a downtown area be dense, population and building-wise? Backyards and the outskirts of town should not. Tue, Dec 6, 2011 : 9:19 p.m.
Tue, Dec 6, 2011 : 9:15 p.m.
Tue, Dec 6, 2011 : 9:12 p.m.
djm, we can argue all day about to whom the value belongs. It's subjective. But, land that wont, ultimately, be turned into a mini-mall, a Wendy's or a Gas Station is inherently worth more (in my opinion, I'm willing to concede) than a parcel of land that will ultimately be developed and then re-deveolped again. Grass is good. Trees are good. The more Ann Arbor grown, the less those things will be available to all. Tue, Dec 6, 2011 : 9:06 p.m.
Tue, Dec 6, 2011 : 8:32 p.m. Spend spend spend. Spend our money on vacant land, artwork at the intersections, etc. Soon the Ann Arbor City Council will match our President's spending habits. Hey, it's the taxpayers money so let's spend it. Wed, Dec 7, 2011 : 4:31 a.m. If you don't like the kingdom, why did you move here? Voters approved the Greenbelt. If you don't like your tax dollars being spent that way, there's 100 other communities in SE Michigan you can live in. Move there and be happy. Tue, Dec 6, 2011 : 8:52 p.m.
Tue, Dec 6, 2011 : 8:28 p.m.
Save money from expanding the boundry and change the Huron Hills charter to secure that land before one more dollar is spent! Take care of what we already have first - Huron Hills Golf Course and A2 City Parks before we worry about expanding the boundries. Tue, Dec 6, 2011 : 8:24 p.m.
Why no love for Ypsi Township in the Greenbelt boundary? Wed, Dec 7, 2011 : 4:30 a.m. Most of the land is already developed and Ypsi Township has expressed no interest in participating. Tue, Dec 6, 2011 : 8:23 p.m. This is starting to look more like a green wall than a green belt.! Also, note that much/most of the 'green belt' lies outside the city of Ann Arbor - for example, the southern border of the green belt is well south of Ellsworth Road and is squarely in Pittsfield Township. So is this really a pre-emptive strategy for future expansion of the city limits to extend to the green belt??? And then will Ann Arbor build a moat outside the green belt to keep everyone else out?? What? The greenbelt is outside the city limits? Just as was promised to voters when it was proposed. If Pittsfield Township thought the city was going to use the Greenbelt to expand into the Township, they wouldn't have supported the city's efforts. Guess you'll have to find a new conspiracy theory. Tue, Dec 6, 2011 : 8:15 p.m. This is a no growth strategy cloaked in a green belt fantasy and folks are buying it.....and paying for it! Wed, Dec 7, 2011 : 2:48 a.m. It stops growth out, and starts growth up. It raises the value of developed land by reducing the supply of develop-able land. Eventually this leads to more density, and more efficiency. Any landowner paying this millage should, in the long run, see a return on their investment as the value of his land rises. Tue, Dec 6, 2011 : 7:55 p.m.
Tue, Dec 6, 2011 : 7:52 p.m.
Hey, let's sell of Huron Hills so we can give a few more farmers a once in a lifetime windfall. Three weeks removed from the election. Between this, the art fund bad joke and the pedestrian mind reading ordinance, nothing was learned. Tone deaf beyond belief. Wed, Dec 7, 2011 : 2:12 a.m. I talked to my council person. Thanks for asking. 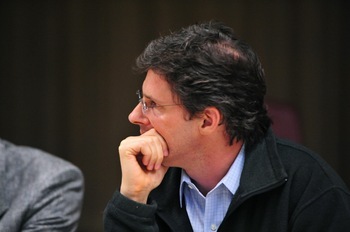 Tue, Dec 6, 2011 : 10:18 p.m.
Did you attend any of the meetings to share your views? Tue, Dec 6, 2011 : 7:15 p.m.
Must be some important potential campaign donors with spec land in those quadrants. Tue, Dec 6, 2011 : 6:35 p.m. Thank goodness there is at least one voice of reason on council, Jane Lumm. Using the fund to maintain the parks withing the city is a much better use of taxpayer money, as opposed to paying for land that the public is not allowed to set foot on. So far the city has spent 18 millions dollars on land that public has no right to park, camp or set foot on.